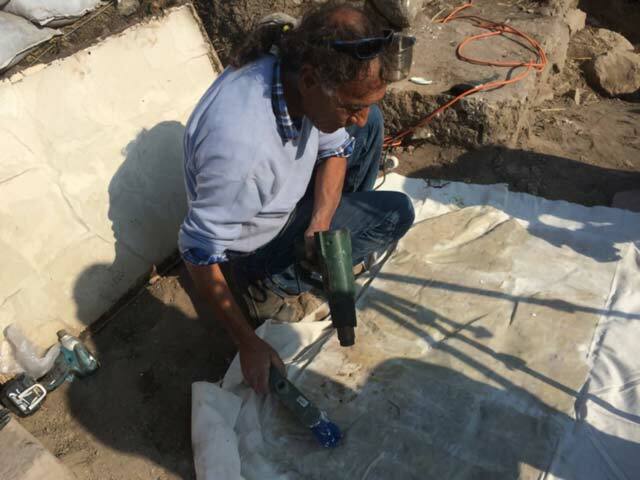 In November–December 2015, the first season of the Avery-Tsui excavations was conducted at Kursi Beach (License No. G-88/2015; map ref. 260589/748134). The excavation was directed by H. Cohen under the scientific supervision of M. Artzy (field photography) of the Hatter Laboratory, Leon Recanati Institute for Maritime Studies of the University of Haifa, with the assistance of L. Matthews, S. Roth and S. Huixin (assistant supervisors), R. Stidsing (database management and artifacts registration), M. Oren-Paskal (ceramics), A. Holdman and I. Ogloblin (geology of the inner harbor), G. López of the Institute for Human Development in Spain, C. Morhange of the University of Aix-en-Provence and D. Kaniewski of the University of Toulouse in France (specimen treatment), B. Arubas and M. Edelkop (plans), Y. Salmon (preliminary GPR in the inner harbor), J. Munro (photography and excavation website), I. Katz (drone photography), J. Neguer (conservation consultation), Y. Dray (conservation), A. Karasik (3D inscription photographs) and E. Shaked (field photography). The participants in the excavation included students from the Department of Maritime Civilizations at the University of Haifa, archaeology students from China and volunteers from Taiwan, Russia, England, the United States and Israel. Additional assistance was rendered by D. Barshad, D. Avshalom-Gorni, O. Zingboym and D. Syon of the Israel Antiquities Authority, Z. Zuk, I. Bardowicz, D. Pilas and M. Yechezkel of the Nature and Parks Authority, E. Malka, head of the Ramat Ha-Golan Local Council, the Ribak family of Chateau Golan, M. Elfasi of the Odem Mountain Winery and students from Ulpanat Nov in the Golan Heights. 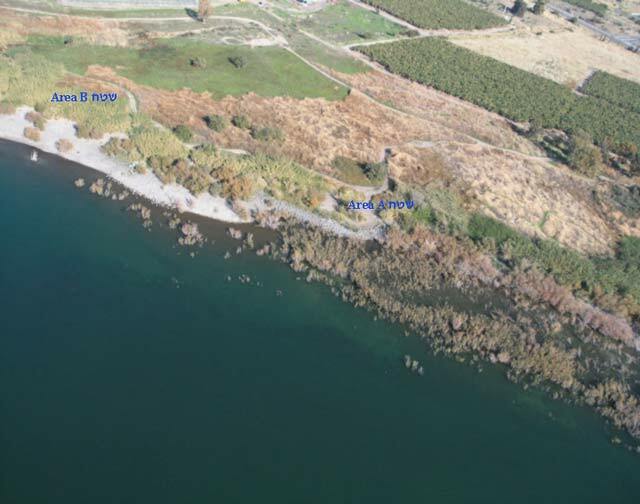 The Kursi Beach archaeological site (Hartal and Ben-Efraim 2012: Site 12, Horbat Kursi [Harbor]; Fig. 1) is located in the Kursi Beach Nature Reserve, on the fringes of the western Golan Heights and the eastern shore of the Sea of Galilee, c. 1 km northwest of Kursi National Park. The entire complex was declared a nature reserve in 1980, and it was named Kursi Beach after the Syrian village and the nearby Byzantine site. It is widely believed that this is the settlement of Kursi that is mentioned in the Talmud or the “Land of the Gedarenes” or “Gerasenes”, where Jesus preformed the Miracle of the Swine (Matthew 8:28; Mark 5:1; Luke 8:26–27). An ancient settlement on the northeastern shore of the Sea of Galilee was known since the 1960s (Nun 1987; Raban 1988:320–328). 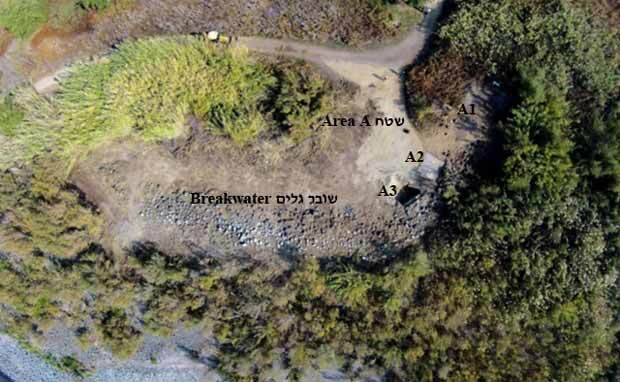 Surveys identified remains of a large breakwater and of a nearby fishpond, a round tower and a basalt threshold stone that were ascribed to a public building, possibly a synagogue. Another survey was performed along Kursi Beach in 2010 (Stepansky and Zingboym 2011). The recent excavation focused on two areas (A, B; Figs. 1, 2): Area A, in the inner part of the breakwater—the inner harbor; and Area B, where architectural remains of a residential area and a public building were discovered. The area, along the base of the breakwater near the current shore, to the south of the settlement, is bordered by Tel Kursi in the south; there is no reliable information regarding the periods when the mound was inhabited. The base of the breakwater was chosen for the beginning of the excavation because it was visible amongst the reeds and raspberry bushes, but its top was entirely obscured by dense thickets and could not be precisely located. It was necessary to remove the vegetation prior to the excavation. Square A1. Remains of walls, the nature of which remains unclear, were visible at the beginning of the excavation. The pottery dated mainly to the Byzantine, Umayyad and Abbasid periods. A channel built on the breakwater in an east–west direction was also exposed. As the excavation went deeper, river gravel was found that apparently served as fill. At a depth of c. 0.7 m, a conical concrete border stone (height 0.54 m) that had fallen and was tilted on its side in a general north–south direction was discovered. Modern refuse was uncovered beneath the stone, including a cluster of barbed wire fences and a plastic IDF jelly tube, at which point it was decided to suspend the excavation in this square. Square A2. 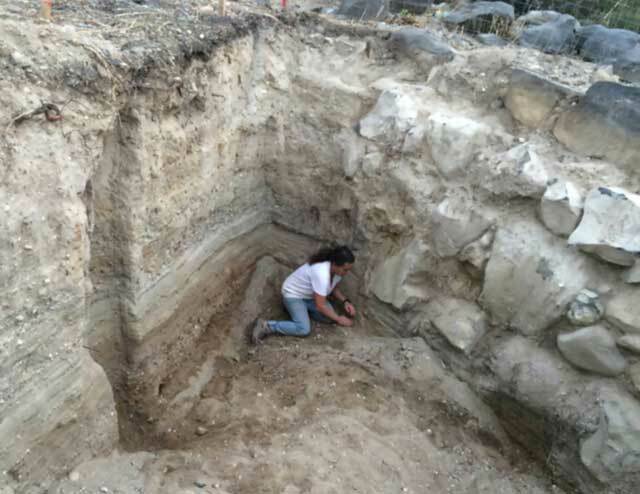 At a depth of c. 0.5 m, it was ascertained that the excavation soil was a deposition or accumulation of geological material, consisting mainly of very thin-grained, light colored gravel. Here, too, it was decided to halt the excavation. Square A3 was oriented in a general southeast-northwest direction, in accordance with the angle formed by the inner face of the breakwater (Fig. 4). After it became clear that the fill was a natural deposition or accumulation of homogeneous material, it was decided to excavate a trial trench (4 × 4 m, depth c. 3.5 m) with mechanical equipment, perpendicular to the breakwater. The inner face of the breakwater (height c. 2.5 m), which was exposed in the trench, was cleaned and documented. The breakwater was built of large basalt stones. On its outer face, facing the sea, the stones (average width c. 5 m) were arranged diagonally toward the west. On the inner face (average height of 2.5 m), the stones were carefully placed vertically. The inner part of the breakwater (the inner harbor) was naturally stratified with fine, light-colored gravelly material, probably brought by flooding and the surf of the waves. Hundreds of very thin layers could be discerned. Samples were taken and sent for analysis in Spain and France. It was possible to discern in the northwestern section, and especially in the southwestern section, that the breakwater was excavated during a previous survey. Architectural elements, apparently of residential buildings, were identified following the removal of the thick vegetation. A marble plaque bearing an inscription (below) was discovered in the center of the northern part of Sq B2. Square B1. Remains of walls and parts of floors (L2002, not on the plan) were found; their nature has not yet been ascertained. Pottery sherds dating from the Byzantine, Umayyad and Early Abbasid periods were collected. Square B2. Remains of a threshold stone and a wall that are part of a public building, possibly a synagogue previously reported by M. Nun, were identified amongst the thick shrubbery (1 m. thick), which had to be removed. The walls in the southern part of the building were exposed (Fig. 5). 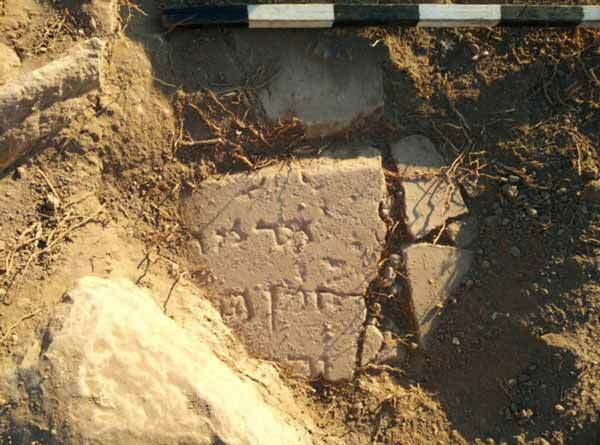 A bema (c. 2 sq m) was discovered in the center of a wall that is oriented in an east–west direction (W2012). Among the finds in the floor bedding of the bema were donkey millstones in secondary use. A floor abutted the northern side of the bema, and further north were five limestone slabs arranged in a general east–west direction. These slabs were apparently found in secondary use and were originally part of an arch. The western part of the building sloped downward, toward the west, probably due to an earthquake. Inside the building, north of the bema was an opus sectile pavement with an incorporated plaque made of light-colored marble (length 1.25 m, width 0.7 m, thickness c. 8 cm; Figs. 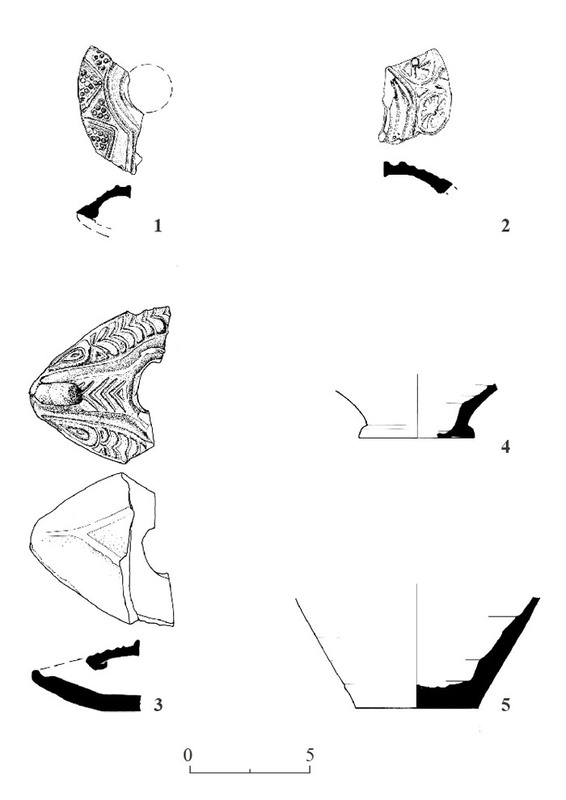 6–8), which was broken into approximately 20 fragments. The marble was apparently imported from the Greek islands or northwest Anatolia (Y. Dray, pers. comm.). The plaque bore eight lines of Hebrew and Aramaic text engraved in an east–west direction, which are read from north to south. The inscription begins with the words “To be remembered in good memory” and ends with the word “amen”. Fragments of two lamps from the Byzantine period (Fig. 9:1, 2) and a lamp (Fig. 9:3) and two jugs (Fig. 9:4, 5) from the Umayyad period were found. Three coins dating from the seventh and eighth centuries CE and a Byzantine coin were also discovered. 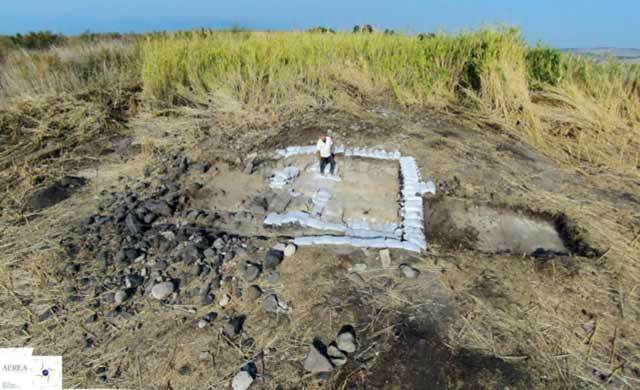 The excavation yielded the southwestern part of a public building, possibly a synagogue, on the shore of the Sea of Galilee, at the western fringes of the Golan. A unique inscription, the first of its kind to be found in Israel, was discovered. The inscription reinforces the assumption that the building was part of a Jewish settlement during the Byzantine, Umayyad and the beginning of the Abbasid periods. Further excavation and exposure of the building will clarify the entire picture. Hartal M. and Ben Efraim Y. 2012. Map of Ein Gev (40) (Archaeological Survey of Israel). Nun M. 1987. 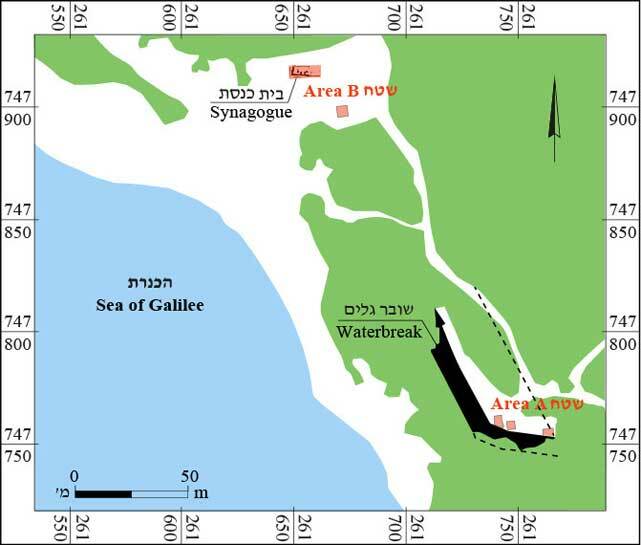 Ancient Anchorages and Harbors around the Sea of Galilee. ‘En Gev (Hebrew). Raban A. 1988. Boat from Migdal Nunia, Sea of Galilee. IJNA 14:311–329. Stepansky J. and Zingboym O. 2011. The Kinneret Trail, Survey. HA-ESI 123. 1. The Kursi Beach site, looking northeast. 2. Location map and the excavation areas. 3. The eastern edge of the breakwater, looking south. 4. Area A and the breakwater, looking north. 7. The inscription at the time of its discovery. 8. Removing the inscription from its location.